"It feels great. It's obviously a dream come true," he said. "I get to play with the top players in the world." The 24-year-old joins the Knighthawks from the Paris RiverWolves of the Arena Lacrosse League (ALL), where he collected nine goals and 19 assists in 13 games. Lee was one of the standouts at the 2018 National Lacrosse League Combine, which convinced the New England Black Wolves to take him in the sixth round (70th overall) of the 2018 NLL Entry Draft. The Toronto native was given his first shot at making an NLL team during the Black Wolves' training camp. "Matt's a real dynamic player," said Knighthawks assistant coach Mike Accursi. "He is extremely fast and aggressive. He did really well in the Combine. I saw him play in the summer and he has a great shot and a good inside game. He has a lot of tools that I think we can use in our offense." Prior to the draft, Lee played four seasons of collegiate lacrosse at Wheeling Jesuit. In 54 career games, he posted 107 goals and 39 assists for 146 points. In 2015, Lee earned ECAC Division II Rookie of the Year honors. As a senior, Lee was named a Second-Team All-Great Midwest Athletic Conference midfielder after finishing third on the team with 23 goals and 32 points. He spent the 2018 summer with the Senior "B" Oakville Titans. This past summer, he notched 14 goals and 10 assists in 10 regular season games. He elevated his game in the playoffs, registering 38 points (15+23) in 16 games. The Titans won the Ontario Lacrosse Association (OLA) title and advanced to the medal round of the President's Cup tournament. "Matt brings speed and agility to our offense," said Knighthawks Owner and General Manager Curt Styres. "He gets guys open and can finish when he is given the opportunity." 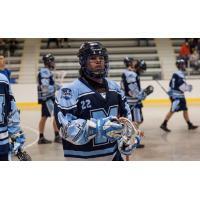 Lee has played parts of two seasons in Major Series Lacrosse with the Oakville Rock. His best season was in 2017 when he played in 11 games and recorded 12 points (5+7). Before jumping to the senior loop, he played four seasons of Junior "B" ball with Mimico. In 2012, he helped lead the team to a playoff berth, while finishing third on the team with 48 points. He also placed second in assists (32) and sixth in goals (16). The following campaign, he was second on the team in assists (28) and points (46), and fifth in goals (18). The 5-foot-7, 185-pounder also competed in four Junior "A" seasons, making stops in Mimico, Mississauga and Kitchener-Waterloo. In 2014, he was in the top three in points in the playoffs with nine points. In his Junior "A" career, Lee scored 54 goals and chipped in 47 points in 42 regular season games, while adding 32 points (15+17) in 11 playoff contests. Lee joined the Knighthawks on Wednesday night for the team's weekly practice. On Saturday, Rochester returns home to battle the Calgary Roughnecks at 7:30 p.m. at Connors & Ferris Field at The Blue Cross Arena. "He is another young player who will help our offense when called upon," said Knighthawks President of Lacrosse Operations Jake Henhawk. "He has been doing well in the ALL and has had a very solid junior career in Mimico. We look for him to bring his fast and physical play to our team. We like the speed and pace he can bring to our offense."